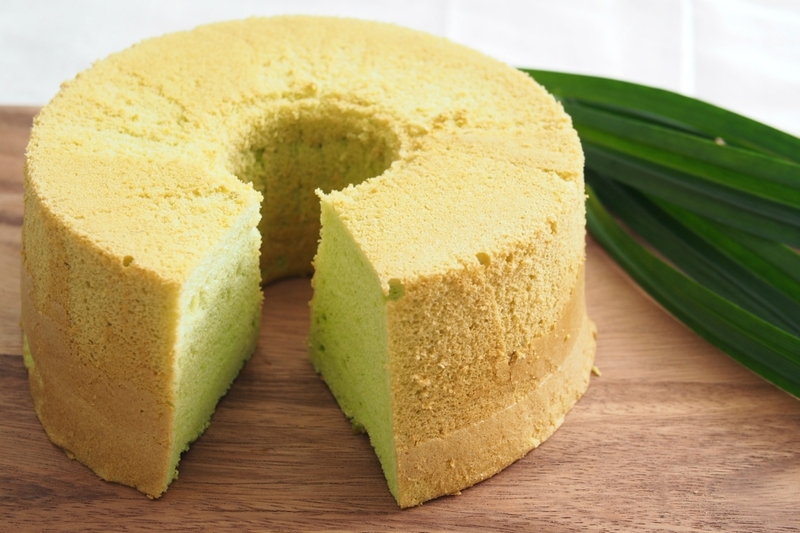 I remember the last pandan chiffon cake I baked was more than a year ago when I started this blog. The pictures shared in my first post were not as good then. This time I tried another recipe from Christine’s Recipe which uses the smaller tube cake pan (20 cm). I omitted the 100 ml of coconut milk and increased the pandan juice to 60 ml. I forgot to turn off the oven fan and reduce the temperature after 15 minutes. This caused the cake to crack a little on its surface. However, it still tasted just as good. Beat the egg yolks and 20 grams sugar with a hand whisk till sugar dissolves. Add pandan juice, salt and olive oil. Combine well. 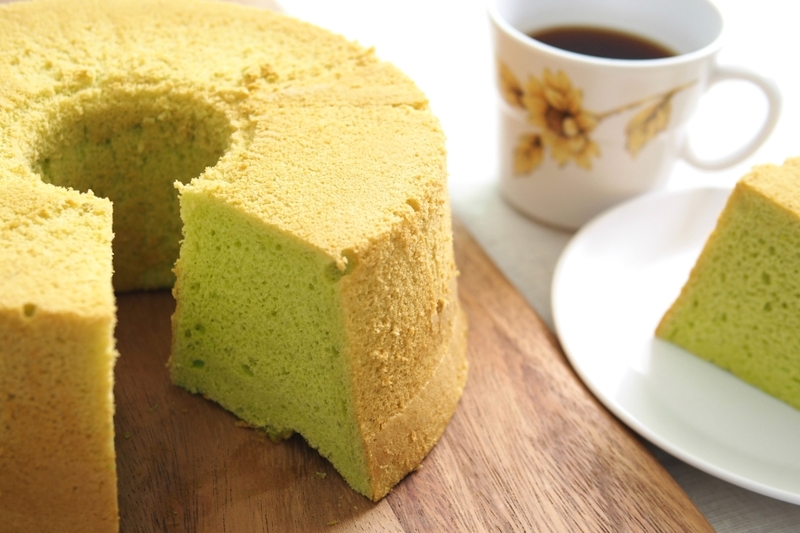 Sift in cake flour and baking powder in three batches into the egg yolk mixture. Mix well and set aside. Spoon out 1/3 of the beaten egg whites and fold into the egg mixture. Lightly fold in the rest of the beaten egg whites with a spatula, until just combined. Pour into a 20 cm tube cake pan and bake in preheated oven for about 35 to 40 minutes. 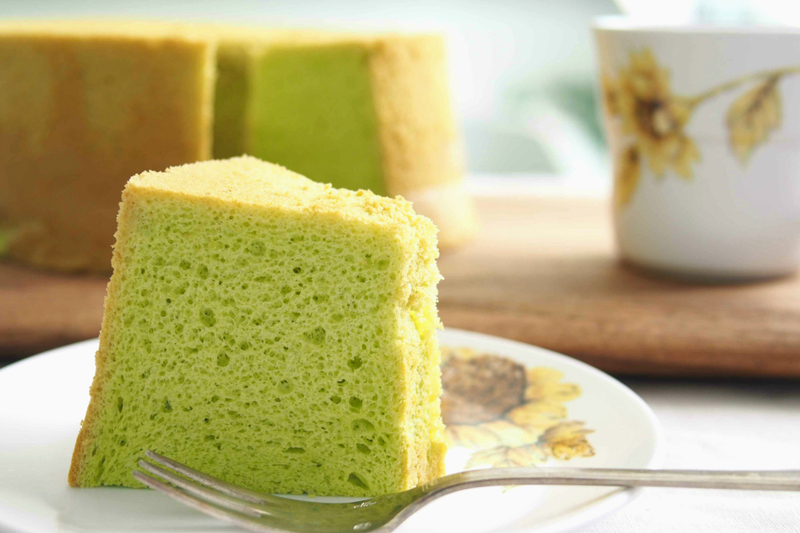 After baking the first 15 minutes, if you find your cake gets browning, reduce heat to 150C (302F) and turn off the fan mode, continue to bake until a toothpick inserted into the centre comes out clean. Remove cake from the oven and invert the pan. Allow it to cool completely before removing from cake pan. Chop pandan leaves into chunks, Blend pandan leaves with water in a food processor until fine. Place pandan leaves in a muslin bag and squeeze out the juice. If you don’t have a muslin bag, just use your clean hand to squeeze out the juice through a sieve. Leave the pandan juice in the fridge for 3 - 5 nights. The chlorophyll will sink. The longer you leave in the fridge more concentrate the juice will be. Pour away the top layer. Use the concentrate pandan extract in the bottom.